Note: While this article will consider the harm caused by unscrupulous photographers, we will not share their photos as a matter of principle. While links to the offending material will be provided for context, every effort has been made to ensure that the photographs used in this article are from reputable sources. Cute animals are commodities that are not hard to sell. Whether it is a photo, a video, or even the animals themselves, people seem to be powerless to resist the allure of “cute”. This fact has been capitalised on by many newspapers, magazines and websites who are all too aware, that cute animals are a surefire way to grab their audience’s attention. Science tells us that cute animals essentially hijack our evolutionary desire to care for the young and helpless of our own species, which is ironic, considering our quest for cute is leading to acts of unimaginable cruelty. We often find it amusing when animals appear to be engaging in anthropomorphic behaviours, however, these behaviours are frequently indicative of an animal suffering distress. Take for example, the chimpanzee: When a chimpanzee is nervous, it may display a facial expression that looks incredibly like a toothy human grin. In this case, a “smiling” chimp is anything but happy. Similarly, we’ve all seen photos of frogs “rodeo-riding” a large beetle, or lizards playing “air guitar” on a leaf, and while these photos would be very amusing if the photographer had stumbled across such incidents, the simple fact of the matter is that these animals do not engage in these behaviours naturally; These photos have almost certainly been staged, and have almost certainly resulted in the animal being distressed, injured, or worse. Take for example the recent viral photo of a frog riding a beetle. The images suggest the frog is riding the beetle “rodeo style”, and the frog’s wide mouth suggests it may even be shouting “Yee-haw” like its’ cowboy counterpart. However, the truth is, the image has almost certainly been staged and amphibian experts, such as Jodi Rowley, have weighed in on social media, suggesting that the “mouth agape” posture displayed by the frog is only ever seen in times of extreme distress. The narrative behind these photos is almost always the same; The photographer claims to have stumbled upon these scenes in a natural setting and quickly snapped a photo upon noticing the amusing behaviour. 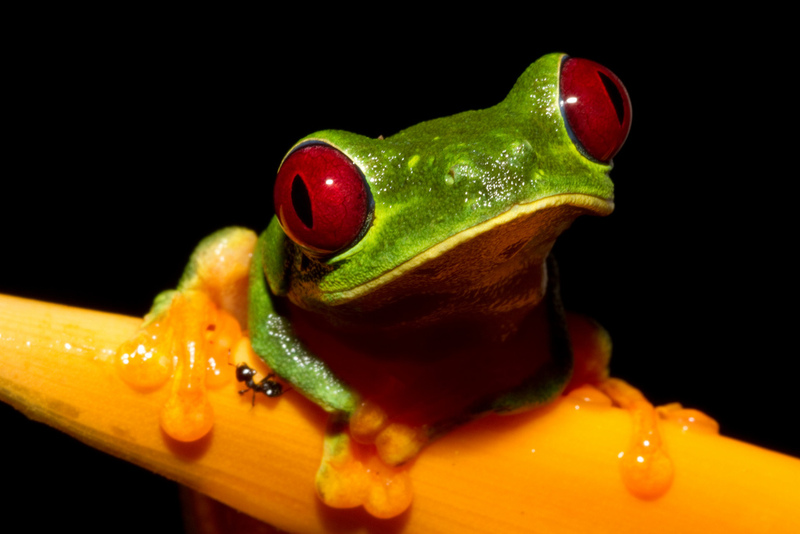 One Indonesian photographer had the “good fortune” of stumbling across a red-eyed tree frog engaging in kung fu and “flipping the bird” to the photographer. However on closer scrutiny, this story doesn’t hold any weight. For one thing, this species is utterly incapable of naturally assuming the poses captured by the photographer (they simply lack the necessary musculature), but far more damning, is the fact that this species is not native to Indonesia and as such the photographer couldn’t possibly have stumbled across it in the wild. In all likelihood, this animal was purchased in a pet-shop and posed using fishing line, which was later removed with image manipulation software. For a more in depth discussion of this practice, please read this article. This practice is so prolific it is nearly impossible to discern which photography sources are “cruelty free”, but sites such as National Geographic have much higher standards than most tabloids and are a good place to start. When in doubt, consult an expert. A more indirect course by which cuteness can inflict cruelty is via photography farms and roadside zoos. These “farms” continually breed exotic animals such as wolves, bears and lions because the cute cubs are highly sought after by commercial photographers. Michelle Smith is a volunteer with The Colorado Wolf and Wildlife Center, and she described some of the issues with these farms for us: “The … type of photo farm, like where our wolf named Princess is rescued from, is where animals are raised for the sole purpose to have photographers come in and take pictures of them to sell for profit, or to use on cheap calendars and other gift items. Veterinary care and quality of life are subpar in these places. The animals are often kept in small caging until they are “ordered” for photos, when they are let into the photography area. For example, if someone wants to take pictures of wolf puppies by a den, the animals are taken out of the crate they usually live in and dropped in a hole that has been dug out to look like a den, to stage the photo shoot. ” (The subpar conditions at some of these sites are exemplified by a USDA inspection that cited one facility for 31 violations of the federal Animal Welfare Act). These organisations may also generate revenue by allowing the public to interact with the cubs. However, as the cubs mature, they lose their “cute factor” and also cannot safely interact with the public anymore. This quickly leads to a surplus of animals which the farms need to offload. If the animals are lucky, they are adopted by organisations such as The Colorado Wolf and Wildlife Center, but all too often, in countries like South Africa, they are sold on to the canned hunting industry. Canned hunting involves paying to hunt animals that are hand reared and habituated to humans, thus making a kill virtually guaranteed. So how can the conscientious cute-animal aficionado avoid contributing to this industry? “We always encourage people to “know their photographer”” says Smith” or to buy from the big-names like National Geographic which actually sends photographers out to capture scenes of truly wild animals”. In a nutshell, we need to recognise that we are in a consumer/producer relationship with the content-mills that pump out these images. Your attention is a currency, and how you spend it matters. If you engage with content that is produced via animal abuse, then you will contribute to the profitability of that industry. Conversely, if you boycott this content and only engage with reputable sources, then you help to tackle the problem. In John Steinbeck’s “Of Mice and Men”, Lennie’s fascination with softness and cuteness comes from a place of innocence, but nonetheless has consistently tragic consequences. The parallels with the contemporary, cultural fixation on “cuteness” are striking. Perhaps it is time to take our unchecked, cultural obsession with “cute”, and tell it about the rabbits one last time, before mercifully putting an end to it. We would like to extend our thanks to Michelle Smith and The Colorado Wolf and Wildlife Center for their assistance in writing this piece. We encourage you to visit their website for more cute animal photography you can feel good about! We would highly recommend following both David Steen and Jodi Rowley on social media and via their respective sites; Living Alongside Wildlife and Jodi Rowley. Thanks to Carina M. Gsottbauer for providing us with additional material on this subject (Posted below). Her Flickr account features some great photography that you can enjoy guilt-free! Is staging, live baiting and sedating animals common practice in wildlife photography? Superior National Forest’s Flickr. Photo used under creative commons license. Brian Gratwicke’s Flickr. Photo used under creative commons license. Ken_from_MD’s Flickr. Photo used under creative commons license. This post is a “The Blog Awards Ireland 2015” finalist in the Best Blog Post Category! Thanks to everyone who voted. We appreciate your support!